While there are many foods that have power to arouse happiness, Malaysian nasi lemak takes satisfaction to the next level. For local Malaysians that leave their home country, nasi lemak is THE MEAL they crave, the comfort food they long for most. And once you’ve had it, it’s entirely understandable. 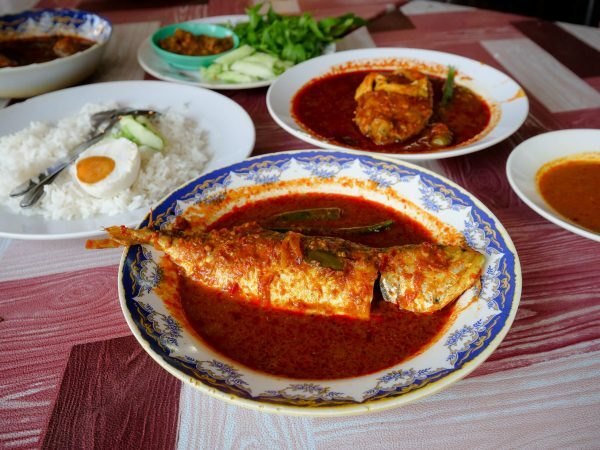 In Kuala Lumpur, one of my main objectives was to explore nasi lemak – to dig in a little deeper and get a flavor for one of Malaysia’s most beloved foods. The rice is initially soaked in coconut milk and pandan leaves before being steamed to give each grain a fragrant light coconut creaminess. Nasi lemak is traditionally served in small cone shaped banana leaf packages filled with rice and a variety of spicy toppings, but you can also find nasi lemak set up similar to a nasi campur style feast. Each bite is a celebration! 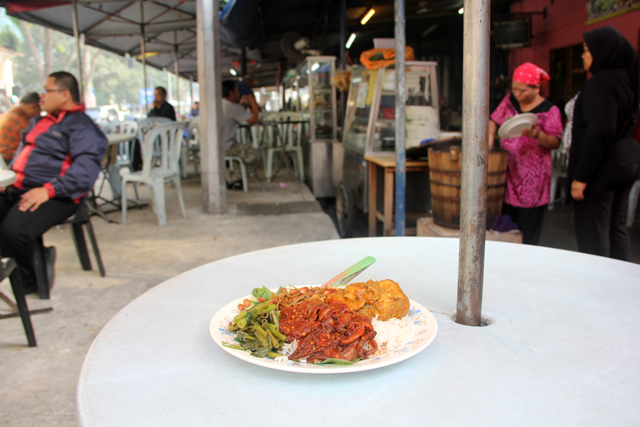 While exploring Kampung Baru, a local Malay area of Kuala Lumpur located near the center of town, I stumbled into Antarabangsa Nasi Lemak. At the time, I didn’t know it was so famous, but the tables were full, and as I ate there was a continual stream of takeaway customers. By the time I arrived, at about 11 am or so, there was evidence that a few of the dishes had already run out. All was good though, they still had my favorite nasi lemak supplement, sambal sotong, squid cooked in chili sauce. A fried egg, a few spoons of crunchy ikan bilis (fried anchovies), a scoop of chili sauce and a few slices of cucumber to garnish and I was ready to dine. 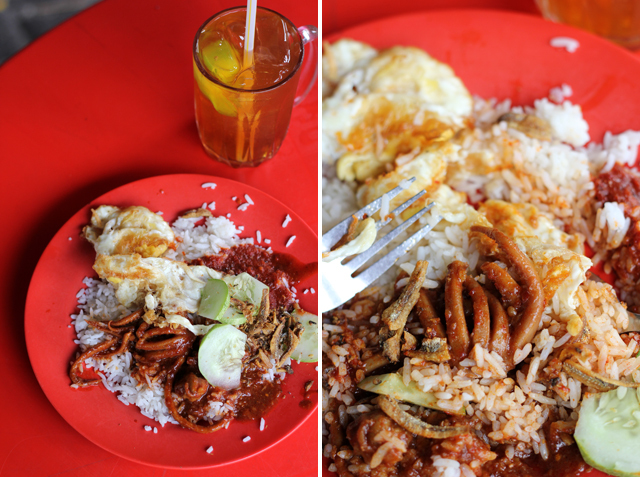 Just like loco moco, the sloppier and saucier things get with nasi lemak, the better! The squid was a little sweet, reminded me of Korean nakji bokkeum, and had amazing flavor. But the real hit was the simple fried egg smothered in sambal chili sauce with the coconut fragrant rice. Open: Many say 6 pm – 5 am daily… but I went at 11 am and it was open.. so not entirely sure? The next day I wanted more nasi lemak. After digging through a number of Kuala Lumpur food blogs, I decided to try a famous stall near Dang Wangi LRT station known as RA Nasi Lemak. 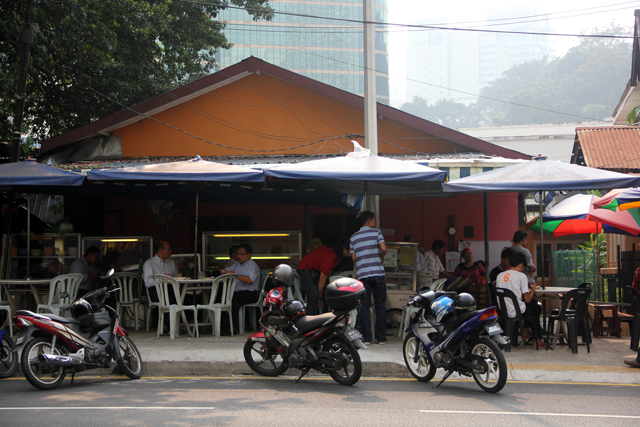 Yet again served from a home and shaded by pop-up umbrellas, RA Nasi Lemak seemed to attract a diverse demographic of hungry locals – businessmen, construction workers, BMW drivers, bicycle riders, hair salon stylists, and a random foreigner (myself) pursuing nasi lemak. As soon as I got in line, the lady opened the wooden barrel of rice which unleashed a puff of steam that literally made me drool. Though busy, the homely restaurant had a comforting motherly atmosphere to it, kind of like the local Zanzibari mix restaurant in Dar Es Salaam. Unlike Antarabangsa Nasi Lemak where you point to the topping and they serve you, to my delight RA Nasi Lemak was self service. 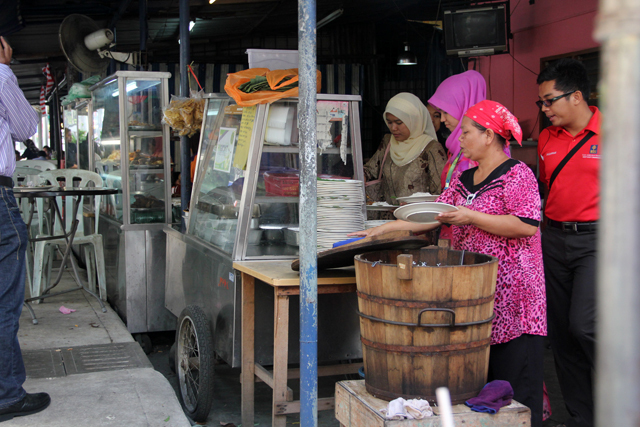 Yet another challenging Malaysian food choice… but a great challenge. I was hoping to see some stink beans in the mix, but they weren’t available. I can state with 100% certainty that nothing served at RA will be even close to a bad choice. 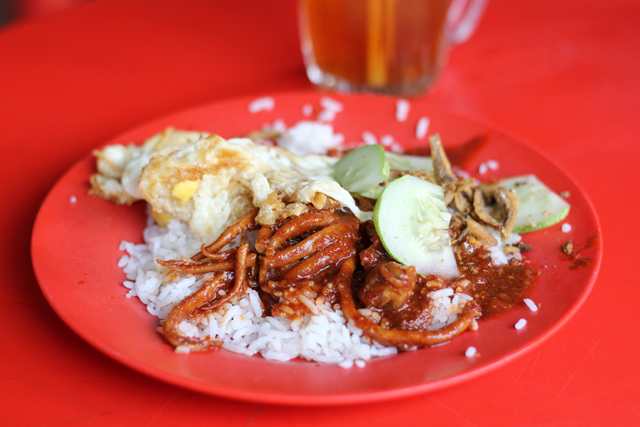 Is there anything better than a plate of nasi lemak? A pile of steamed coconut infused rice, more sambal sotong (squid in chili sauce), stir fried morning glory, ikan bilis, cucumbers, and a generous anointing of chili sauce was the outcome. For the main course I chose a succulent piece of chicken rendang (chicken stewed in coconut cream and spices). The nasi lemak was honestly unbelievable. Each spoonful was among the most precious bites I’ve ever chewed in my life. If I had to choose one nasi lemak restaurant over the other I’d probably go with RA Nasi Lemak due to the self service and the amazing sambal chili sauce. But both restaurants were stunning. One thing is certain – at either Nasi Lemak restaurant, the dish washer will love you because you’re going to lick your plate completely clean. Do you love Nasi Lemak? Here’s a map so you can find both of the restaurants. 45 comments. I'd love to hear from you! Yes, Nasi Lemak is must try but I would prefer the small pack with banana leaf, just personal preference! Nasi lemak is literally translatted to “creamy rice” not “fatty”. Fat (noun) & creamy (adj) use the same word i.e. lemak. Love your videos. If you ever come to Malaysia again, be sure to try out Nasi Lemak Village Park in Damansara and also Nasi Lemak Tanglin. You can’t miss it if you google it. Thank you very much Arif, ok, will remember your recommendation next time! Nasi lemak antarabangsa is nowhere near as good as it used to be,in fact many other places in kl tastes much nicer and cheaper than that. Thanks for sharing Meow. 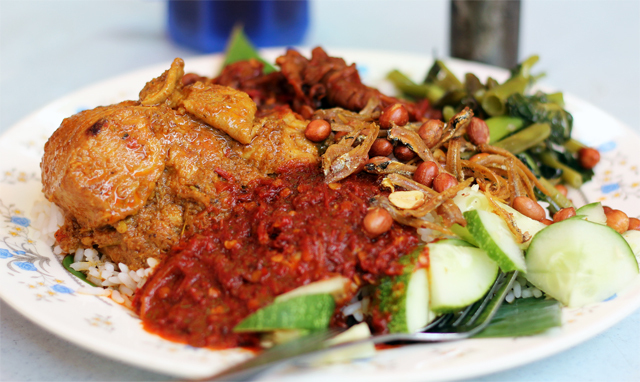 What other places would you recommend for great nasi lemak in KL? Is Nasi Lemak more vegetarian (lacto-ovo) friendly compared to Nasi Campur? Or the other way around? Does it vary by stall too? Any insight is appreciated. I want to make sure we try out to best vegetarian Nasi Lemak and Nasi Campur stalls in KUL. Hey Avinash, hmm, I’m not so sure about the vegetarian nasi lemak and nasi kandar. 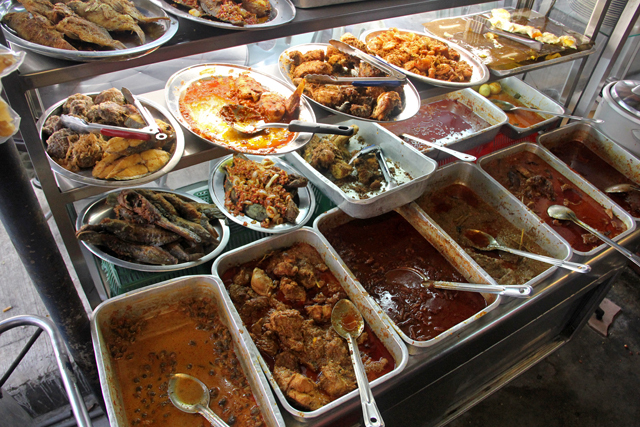 Though at nasi kandar you normally have more choices so can get vegetarian options. Enjoy! 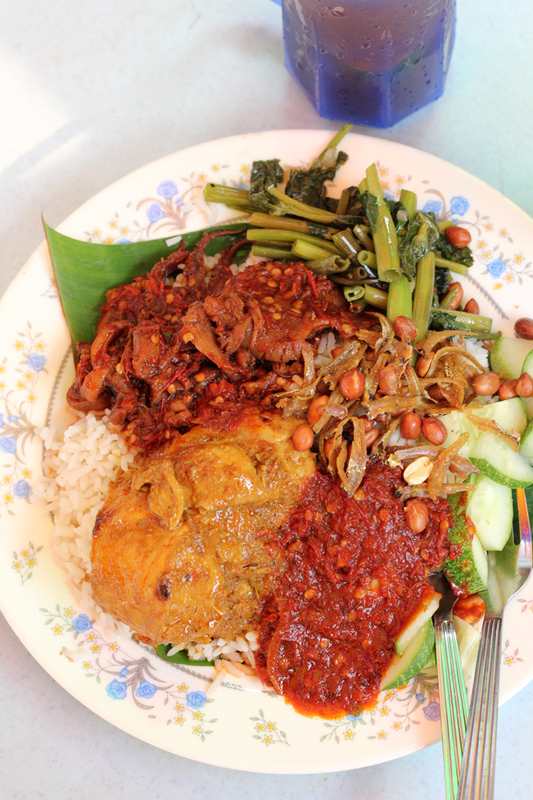 Whether it’s nasi kandar or nasi lemak, if you want to taste a vegetarian one, just visit a vegetarian restaurant. There are lots in Brickfields. Mamak restaurants are generally not very vegetarian friendly. 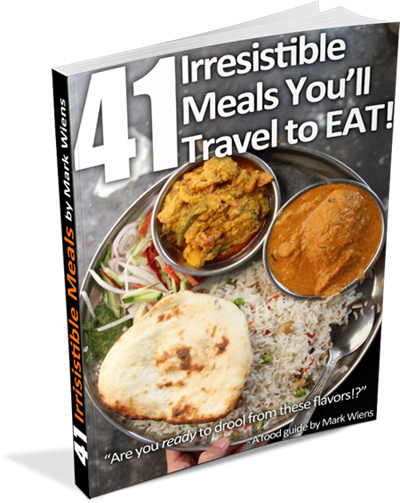 You will get very few flat vegetable dishes, the regular sambar and papadam(if available). 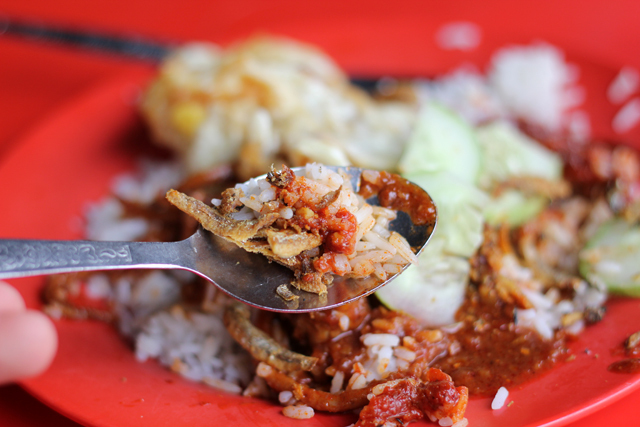 If you buy nasi lemak in regular nasi-lemak stalls, they won’t be vegetarian even if you do not take the eggs or anchovies because the sambal is usually made of belacan/shrimp paste. It’s easily one of the best foods in the entire world! Ah, cool, thanks Bama! I’ll have to try some Nasi Uduk in Indonesia when I’m there next time! mark: the thought of those plates of nasi lemak getting into my mouth. The delicate sweetness saltiness of the sambal gravy playing in my mouth like little kids do. 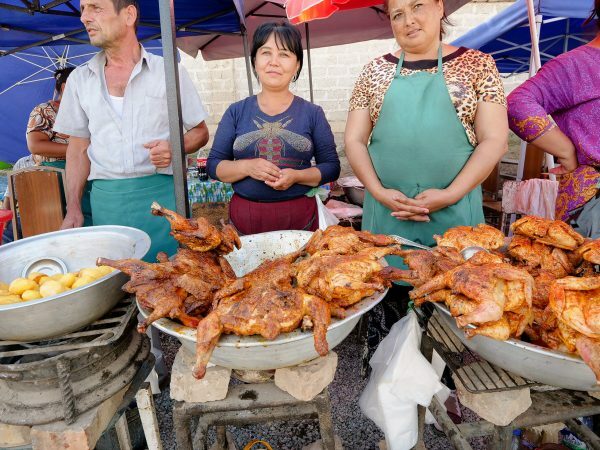 The aroma of friend chicken and eggs that cause chaos and confusing to my other senses. Especially to the eyes….its just to much…. Haha, thanks for sharing your take on nasi lemak Sully, and nicely described. 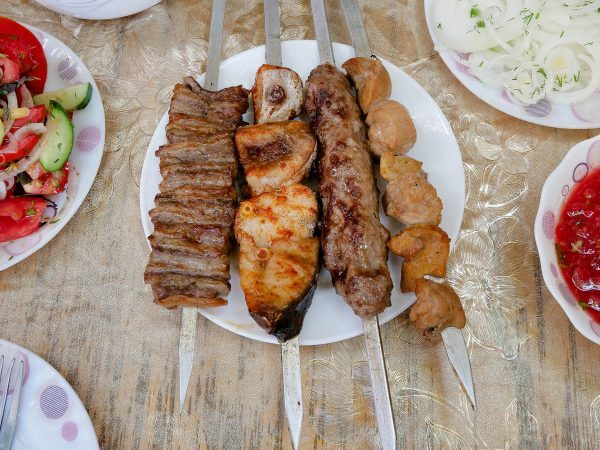 It’s such a good dish, it’s nearly impossible to fully put it into words! Yes, you are right. Being away from Malaysia for an extended period of time, one of the food that I missed the most was Nasi Lemak. 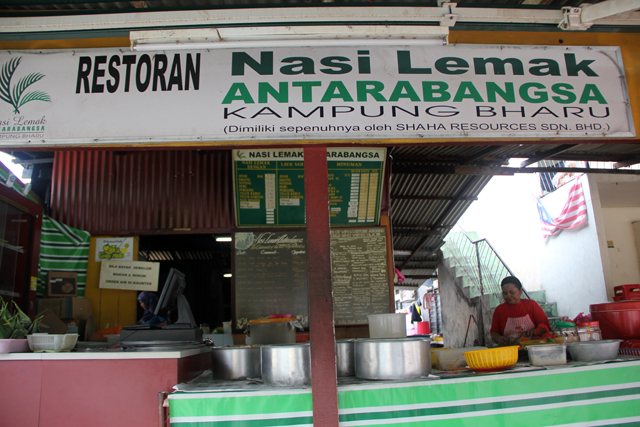 I used to be a regular at Antarabangsa when I lived in KL, but now my favourite is actually in Sarawak. If you make it here, I’ll bring you there. Awesome, thank you so much Noel! I would love to try the nasi lemak in Sarawak, and that’s a place I’d really love to visit as well! Ahhh, I miss the crispy, salty, teeny tiny fried fishies! Yes, they are so good, aren’t they?! Nasi Lemak at some part of SG is damn expensive, or maybe I didn’t search for a cheaper place but the taste was worth it but still expensive hehe. Will definitely try Nasi Lemak when I go to Malaysia! Hey Ada, too bad it’s so expensive in Singapore, you’ll have to eat lots of it when you go to Malaysia! and i love to have a serving of sunny side up egg along with my nasi lemak, the taste and texture of the runny egg yolk in every mouthful of nasi and sambal is just sinfully amazing! I fully agree Sheon. I had an egg the first time and then the second place must have been all out of eggs. But it sure is amazing with a runny egg! Cool, thank you for sharing Sheon! Thank you Fairuz! I know, I want to travel more and more in Malaysia, there’s so much food to discover. I hope to visit Kelantan one day! Is that where you’re from? Great Dean! Definitely get some Nasi Lemak when you’re there! that second plate looks absolutely fantastic. 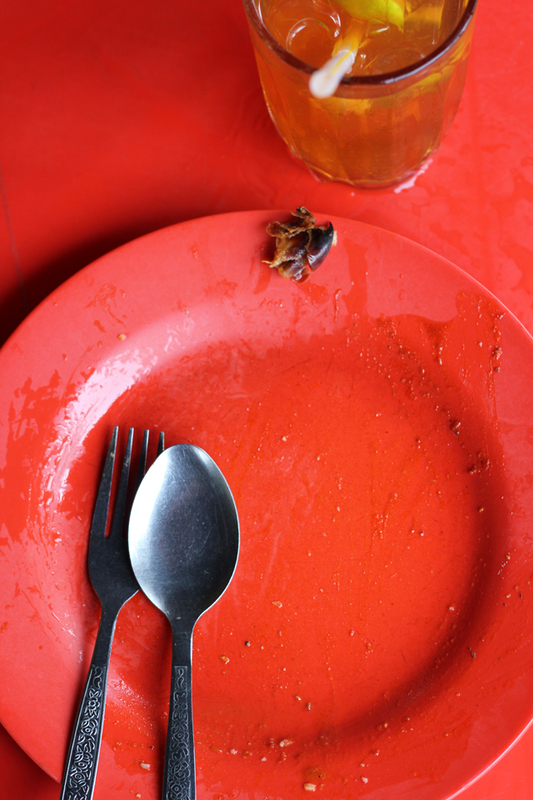 i would have cleaned the plate off in 5 minutes! with my tongue, too! haha. you seriously made me want to head back to KL the soonest I can. Hahaha, you and me both! I nearly had a second plate right in a row, but then decided to eat more at a different place… it’s just so good!